Every once in a while you come across something that stirs your soul and moves you in such a way that it just has to be shared. That is how I feel about Slumdog Millionaire. This movie is brilliant, from the music and vibrant colors to the amazing cinematography and story. This is a beautiful film that you won't want to miss out on. Go see it, and when you do let me know what you thought. Aaron and I especially liked the movie because it reminded us of our time that we spent in India. It brought back memories of riding the autorickshaws and trains, watching cricket games and bollywood films, having chai tea and chapati bread everyday... Those are three months that we will never forget. Here are some pictures from that time, when I was just 19 years old! (right) - Me and my friend, Depak. 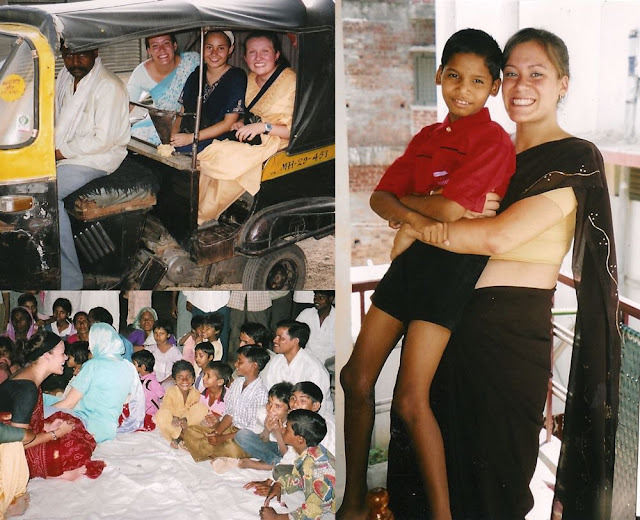 We lived at an orphanage during our time in India and he was one of the many kids who grew a place in my heart. so i went to go see this last night with a friend because i'd heard good things about it and then read your blog and was like, i need to go. so i went and guess who else was there?! chelsea and genci because get this, they read your blog too! haha! thanks for bringing us all together! @ Kendal - I'm sure you got some great stories out of her. Did she tell you the one about our crazy jungle safari and how we slept in trees?